Popularized by , John Denver is know for it's natural beauty. Because of our mountains, we have rivers. The oldest river in the Western Hemisphere, the New River (quite appropriately named, don't you think) ends in West Virginia. We have the Gauley River, which confluence's with the New River in a magnificent cascade to form the Kanawha River, which in turn flows through the center of the State, and directly through the capital city of Charleston (see Map), the largest city in West Virginia. 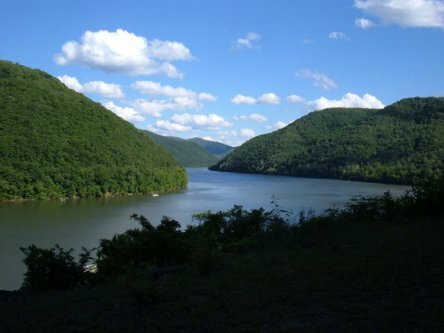 These rivers in addition to the Cheat, Blackwater, Tygart, Monongahela, Ohio and countless others offer tremendous recreational opportunities. Charleston, the capital city, stretches throughout the long Kanawha River Valley, encompassing both hill and dale. The tallest building in Charleston is barely 25 floors tall! ,which, if you think about it, is a plus; how could you possibly build a skyscraper more beautiful than a mountain? The Charleston, West Virginia airport (the largest in the State), sits on top of a mountain. 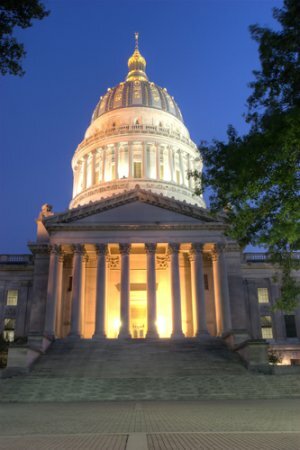 The crime rate in Charleston,West Virginia including the entire population of the Kanawha Valley (around 200,000), reflects that of the entire State, the lowest in America. No more than a handful of murders are committed each year. 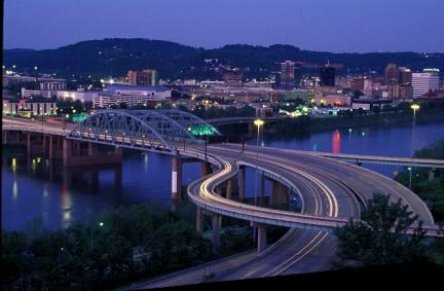 Charleston, West Virginia has no subway systems, but, truth be known, you can get from one end of town to the other, even in rush hour traffic, in less than ten minutes. There are three major interstate systems going through Charleston, West Virginia the smallest city in America to make such a claim. The entire State has six different interstate systems, meaning, from Charleston, West Virginia, you can reach Cleveland, Columbus, Cincinnati, Pittsburgh, Louisville or Charlotte in four hours or less.... Ah, but once you leave the interstates, the drive becomes a thing of wonder. Two lane roads, winding up and down the mountains, offer amazing views and historic places, small towns, poor in wealth but rich in history. West Virginia is the birthplace of Mother's Day, in Grafton; and Father's Day, in Fairmont. We have walnut festivals. strawberry festivals, apple festivals and pumpkin festivals and buckwheat festivals, and arts and crafts fairs and stern wheel regattas and ramp dinners. 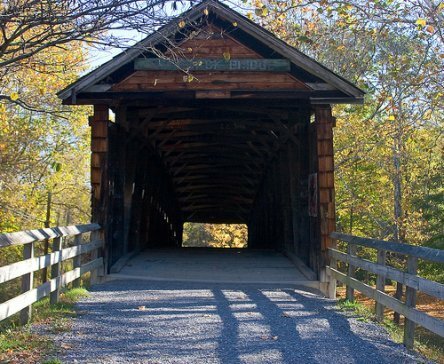 At Phillipi, West Virginia, we have the oldest covered bridge still in use. 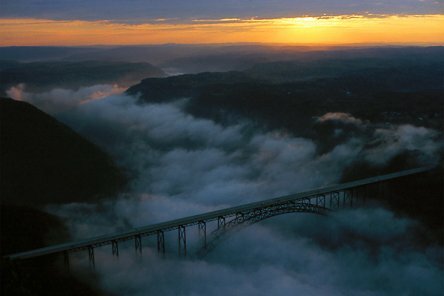 We have Bridge Day, on the New River Gorge Bridge over 800 feet above the New River; the only standing structure in the United States that, one day a year, allows parachuting and bungee jumping. We have college basketball, and minor league baseball and hockey, and, just like all of America, Friday night high school football. We have white water rafting, and skiing, and hiking, and caves, and waterfalls, and camping in every direction. 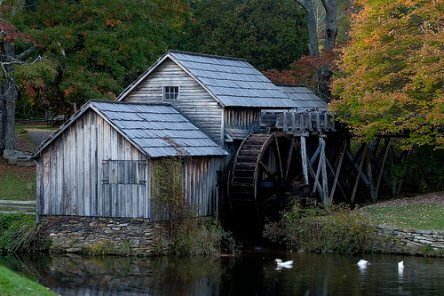 We have Sundays where a leisurely drive in the car can take eight hours, and only cover 100 miles. 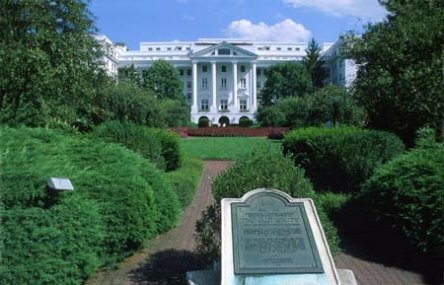 We have bed and breakfasts, and resorts, and golf courses, and museums, and the Greenbrier Hotel. West Virginia has more natural beauty and wonder than any person could ever imagine. And, don’t forget, we also have the “New River Train” that operates each October during the height of the colorful fall season. I know of no other way to show off the beauty of our state to the folks who travel here from all over the country. We have all of this, and yet .... our greatest asset is our people. West Virginians are good people. We care about each other. We talk to our neighbors over the backyard fence. We grow tomatoes for the entire neighborhood. We turn around in each other's driveways, and yell 'howdy' when we do. We sit on the porch on warm summer evenings, listening to crickets, and watching kids catch fireflies. We loan a hammer, or a cup of sugar. We don't take two-hour lunches, but we do spend a few minutes each day with a cup of coffee, and our feet upon our desk, shooting the breeze. 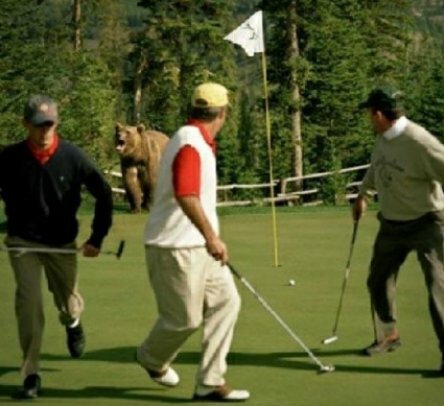 We rarely get in a hurry. We have relatives just down the street. We don't just loan someone a socket wrench, we help them fix their car. We share recipes, and gardening tips, and our last cup of coffee. We baby-sit each other's kids, we housesit each other's dogs while we're on vacation, and we loan each other our cars if we have to get to the drugstore. We ask each other if we need anything as we're going to the market. We celebrate each others accomplishments, and we cry over each other's disappointments. We are a friendly folk. We are West Virginians. Mountaineers are always free! Free to take the time to enjoy life, and hold each moment in our hearts, forever.